He’s been capped over 300 times for Wasps and made over 70 appearances for England, so its safe to say that Joe’s one of the most reliable players the game has seen. 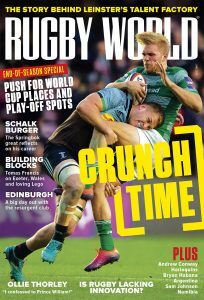 Rugby World caught up with ‘Melonhead’ to chat about Cooper cat, embarrassing moments and doing favours for friends. 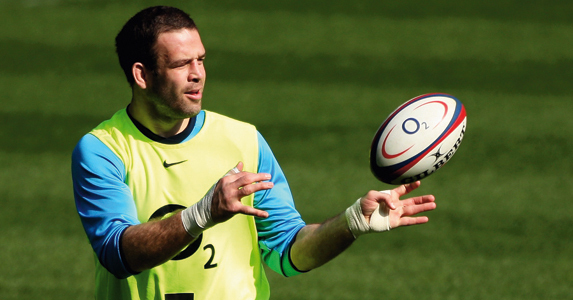 RUGBY WORLD: So who are the jokers in the Wasps and England squads? JOE WORSLEY: James Haskell definitely. He’s always up to stuff, but it’s a case of what you can tell the public! He’s always trying to make life more difficult for Tom Rees. RW: Yeah, he seems to have a vendetta against Tom. Any good practical jokes you can share? JW: I’m partly to blame for this one. Tom Rees went on Soccer AM recently and we persuaded the presenters to ask him about entering Robot Wars, Star Trek, auditioning to be the Milky Bar Kid and so on. James has got plenty of stories about Tom. RW: How do you keep occupied while in camp during the Six Nations? JW: I read my book or the papers. I read quite an eclectic selection of stuff. At the moment I’m reading The Selfish Gene by Richard Dawkins. I also watch a bit of TV or a movie. The other week I was watching Californication. JW: Peter Bracken. I’ll leave it at that. RW: Have you got any nicknames apart from Melonhead? JW: Not really. I’ve had it since school and no one’s come up with anything else. JW: Our cat, Cooper Cat. He peed on our Bang & Olufsen television. We’ve had him for eight years but if it wasn’t for my missus he wouldn’t still be alive! JW: Playing the piano in front of a live studio audience and butchering the rendition. It was some time after the 2003 World Cup and I was awful. It’s a different kettle of fish in front of a live audience and I was a bit out of practice. RW: What about that crazy haircut you had in 2001 [he had short spike dreads] – any regrets? JW: I did that as a favour for a friend who was a hairdresser. Unfortunately I got photographed while I had it like that. People think I had it for ages, but it was only like that for four days. I probably do regret that – it wasn’t exactly the greatest haircut in the world. JW: I’m trying to remember the one I heard recently. It was about prostitutes and bungee jumps, though, so I don’t think it’s appropriate for Rugby World. JW: God knows. Jeff Goldblum. No, not him. There’s a guy who’s been in lots of films, but my mind’s gone blank. I can’t think of his name. He was in a film with Natalie Portman. Clive Owen! He’s relatively tall and looks vaguely like me. JW: Derren Brown. I don’t know if I’d want him to hypnotise me, but I’m sure he could teach me a thing or two while we were stuck in there. JW: My wife, my son and I can’t think what else. I’d make sure the cat was still in there, though! RW: Have you still got a big baseball glove chair? JW: Yeah, it’s in the bedroom. It’s very comfy – everyone likes to sit on it. JW: Once the challenge of rugby has past, I’d like to take on another challenge that is equally as difficult. Watch this space!